Within the hour, Google released new Android distribution numbers for the month of February. The numbers, as usual, aren’t anything to have your IRC troll group run to reddit with, but they do offer up a look at whether or not any Android OEMs have updated phones over the last month. As expected, there have been, so the numbers are changing in the slightest of ways. 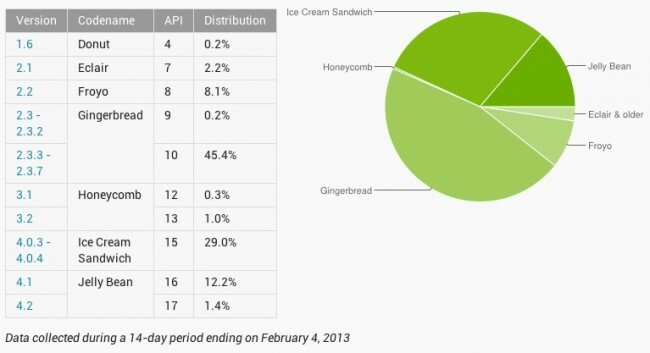 Jelly Bean is up to 13.6% (from 10.2%), Ice Cream Sandwich actually dropped to 29.0% (from 29.1%), Honeycomb dropped to 1.3% (from 1.5%), and Gingerbread still leads all but is down to 45.6% (from 46.6%). Neat, right? If you say so.